Anything passive first takes active energy. The best time to put in the effort is when you are young and not yet ravaged by disease or burdened by family obligations. I still remember being able to snowboard nonstop all day from 8:30am until 4pm. Today, I feel lucky to last from 11am until 2pm before surrendering to the hot tub and a bucket of beer! * Retire early and travel the world. * Start a business in a field you are passionate about. * Find a job that pays less, but is more interesting. * Stay at home to take care of your family without having to worry about money. * Volunteer for causes you truly care about. * Be a big brother or big sister to kids in need. * Spend more time with your parents. * Sit in a coffee shop on a 76 degree day in Santorini for hours on a Monday afternoon. * Write the next great novel from the balcony of a cruise in the Mediterranean. * Eat tapas and drink sangria in Barcelona until 1am on a Monday evening. * Live longer due to much less stress. * Look and feel better due to much less stress. * Experience perfect endless summers over and over again. This post will provide you with the framework for passive income success. If you can work on building passive income for at least 10 years, I’m certain you’ll be able to taste more sweet freedom. 1) Save Until It Hurts Each Month. Passive income starts with savings. Without a healthy amount of savings, nothing works. You need to save at least 20% after contributing to your 401k and IRAs since you can’t touch pre-tax retirement accounts without a penalty until 59.5. Ideally, everyone should first max out their pre-tax retirement funds. However, if you don’t have enough funds and want to retire earlier, then a decision to have more accessible post-tax money will also work. What I did: Saved 50-80% of my after-tax, after-401K contribution every year for 13 years because I knew I could not last in finance for more than 20 years. Today I live 100% off my passive income and reinvest 100% of any income I make online or from part-time gigs like coaching high school tennis to build even more passive income. 2) Identify What You Are Good At. Everybody is good at something. It may be investing, playing an instrument, playing a sport, singing, writing, art, dance or whatever. The more interests and skills you have, the higher the chance you can create something that will provide you with passive income down the road. Due to the internet, one of the absolute best ways to build passive income is by creating an electronic product like an e-book, an online course, an app, or even a song. What I’m doing: I love to write and invest. 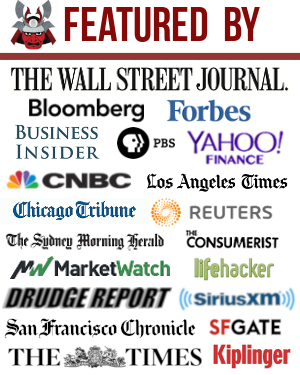 These two interests led me to start Financial Samurai, my personal finance site in 2009. 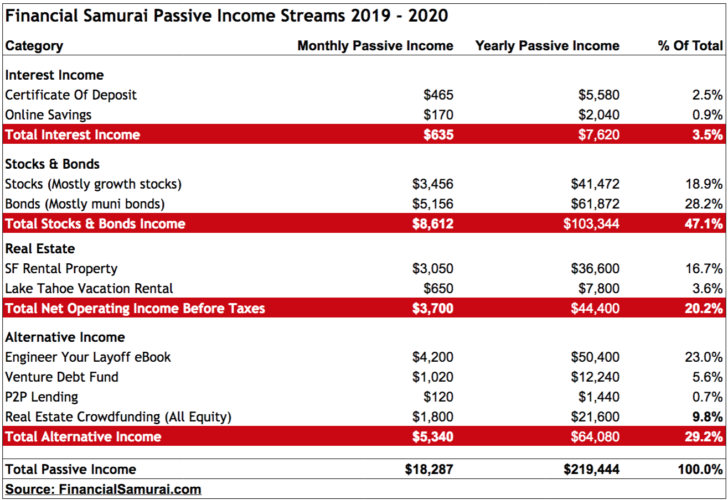 Although writing isn’t passive, Financial Samurai does give me a platform to earn income passively through my severance negotiation book, which I published in 2012 and updated in 2019. 3) Create A Plan. Mark Spitz once said, “If you fail to prepare, you’re prepared to fail.” You must create a system where you are saving X amount of money every month, investing Y amount every month, and working on Z project until completion. Things may be slow going at first, but once you start to save a little bit of money you can build momentum. Eventually, you will find synergies between your work, your hobbies, and your skills that will translate into viable income streams. 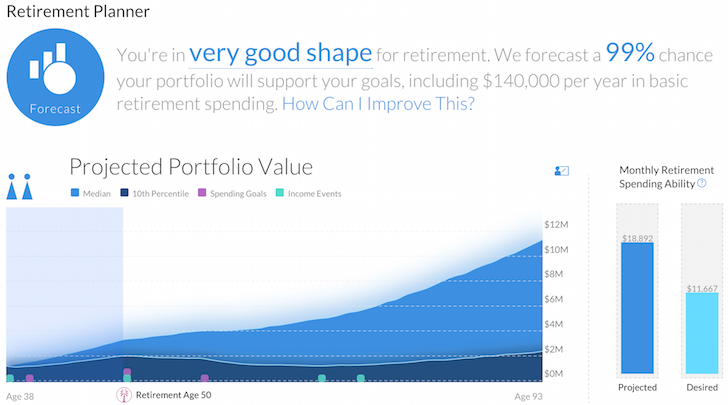 What I’m doing: I use Financial Samurai to write out goals and to keep myself accountable. I also keep track of my net worth and all 10 of my passive income investments with free financial tools online. I don’t want to wake up 10 years from now wondering where all my money went. The internet is your friend. 4) Determine Your Passive Income’s Purpose. You need to have passive income goals. Otherwise, it’s easy to lose focus and give up. A good first goal is to earn enough passive income to pay for food each month. A second goal could be to earn enough passive income to pay for transportation each month and so forth. Calculate your overall basic expenses necessary for survival. Once you have those expenses covered, you are golden. What I did: Based on years of budgeting, I determined that $80,000 a year in San Francisco would be enough for me to live a comfortable retirement life. After leaving work, I calculated that we would need to earn $150,000 if my wife were to join me in retirement. Today, we have a goal of generating at least $200,000 a year in passive income before our son goes to kindergarten in 2022. This adjustment is necessary just in case he doesn’t get into a good public school, since San Francisco has a lottery system. 5) Determine Which Type Of Passive Income Suits You Best. The best way to determine worthwhile passive income streams is by understanding their risk, return, feasibility, liquidity, and maintenance activity. You must always compare the expected return to the risk-free rate of return, which is the 10-year government bond yield currently at ~3%. Any new venture should thoroughly beat 3%. Otherwise, you are wasting your efforts since you can earn 3% doing nothing. What I’m doing:I’ve accumulated 10 different passive income sources based on my interests and for the sake of diversity. However, I plan to reduce exposure to private equity and P2P lending once these investments come due. My realistic goal is to have a blended annual return of 2x the risk-free rate, or ~6%. To sustain a $200,000 a year passive income figure, I will need to accumulate roughly $3.3 million in capital. However, given I’ve got to pay taxes, I’ll probably need closer to $4 million in capital to live off passive income and never touch principal. If I decide to move from San Francisco to the heartland, however, perhaps I can live off $80,000 a year in passive income and accumulate $1.3 – $1.5 million of capital instead. Having passive income allows you to geo-arbitrage. 6) Never Withdraw From Your Financial Nut. The most frequent setback for people looking to build passive income is that they withdraw from their financial nut too soon. There’s somehow always an emergency which eats away at the positive effects of compounding returns. Make sure your money is invested and not just sitting in your savings account. The harder to access your money, the better. What I Do: I’ve set up multiple investment accounts outside my main operations bank that deals with working capital e.g checking, paying bills. By transferring my money to a couple brokerage accounts and two other banks as soon as it hits my main bank account, I avoid the temptation to spend on frivolous things. Real estate is also a fantastic asset class for the long term. The illiquidity of real estate and the transaction costs encourages you to hold for the long term. 7) You Must Force Yourself To Start. “A Journey Of A Thousand Miles Begins With A Single Step.” Laozi was a great philosopher who penned this popular English saying. Anything great started somewhere and you must set aside one day to tackle your financial independence goal. Circle a date on your calendar and cancel all other distractions. What I did: My first two years of work in NYC were brutal. I told myself it wouldn’t be healthy for me to work on Wall St for my entire career because I’d probably die from heart failure before age 40. Having an early death on my mind motivated me to not only save 50%+ from the first year onward, but to also devise a CD, real estate, and stock investment distribution system for my savings every year. My original target retirement date was 2017 at age 40. Instead, I left five years earlier in 2012 at age 34 largely because long-term planning had yielded more income and opportunity. Below is my latest estimated passive income streams which total about $204,000. My current goal is to get this figure up to $250,000 by the time my son starts kindergarten in 2022. This $46,000 increase will become necessary if he can’t get into a good public school and needs to go to private school. If he does get into a good public school, we’ll reallocate the extra income for his college education fund. CD Interest Income ($5,580/year): I only have one CD account left paying 3%. I like to have at minimum 2.5% of my net worth in risk-free investments. Thanks to a rise in short-term interest rates, I’m most likely going to build a CD Step Stool or bond step stool. It’s all about taking advantage of short-term rates. Online Savings ($5,100/year): This is a BIG FOCUS for 2019. I’m actively trying to build a large cash stash given we’ve had such a strong bull run since 2009. With short-term interest rates rising, I’m much more inclined to hold cash earning 2.45% versus 0.1% just several years ago. CIT Bank consistently has one of the highest online money market rates you should check out. 2.45% is a truly awesome money market risk-free rate. The S&P 500 was down -6.4% in 2018, which means you would have outperformed the stock market by 8.85% if you held cash instead. 2019 is shaping up OK, but I would highly suggest everyone build their cash war chest, especially with interest rates going up. Investors are not inclined to take as much risk anymore. I plan to protect the wealth I’ve built in this bull market and play more defense. 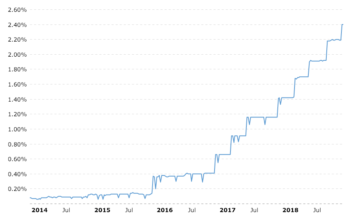 Dividend Income ($39,516): Dividend income is wonderful because it is completely passive and is taxed at only 15% if you are in the 10%, 12%, 22%, 24%, 32%, and even 35% federal income tax bracket. If you are in the 37% income tax bracket you will pay a 20% tax on your dividends. My dividend income portfolio consists mainly of dividend equity and bond ETFs. Municipal Bond Income ($61,872): I own a portfolio of individual California municipal bonds that I plan to hold until maturity and several bond ETFs. Although the Fed is raising rates, I don’t believe long-term rates will rise much higher. In other words, I expect the yield curve to flatten or invert by 2020, portending a recession. In such a scenario, fixed income investments should hold up well. Real Estate ($43,080): I currently own one rental property in San Francisco which I bought in 2003 (2/2 condo), one vacation rental in Squaw Valley, Lake Tahoe (2/2 condo), and my primary residence. My rental income can have 25% swings depending on how good the weather is in Lake Tahoe during the winter. Online Book Sales ($36,000): I published How To Engineer Your Layoff, in 2012, six months after I had negotiated my own severance. Then I updated the book for 2018 with 50 more pages (150 pages total) using more successful case studies and highlighting more strategies for those who want to break free from the corporate grind with money in their pocket. Venture Debt ($12,240) – I invested $200,000 in my business school friend’s second venture debt fund. The target IRR is anywhere from 12% – 18% a year over the next 5 – 10 years. Therefore, I’m hopefully being conservative as the returns are back-end weighted. Real Estate Crowdsourcing – After selling my SF rental house in mid-2017 to simplify life and take advantage of high valuations, I proceeded to reinvest $550,000 of the proceeds ($810,000 total) in real estate crowdfunding to take advantage of lower rates and higher net rental yields in the heartland of America. My SF rental had a cap rate of ~2.4% versus cap rates of 10%+ in heartland real estate where I’ve reinvested. With the SALT deduction capped at $10,000 and a lower mortgage maximum of $750,000 to be able to deduct mortgage interest against, I expect coastal city real estate to slow and heartland real estate to outperform. I’m targeting a 15% IRR on my investments. My favorite real estate crowdfunding platform is Fundrise. They started in 2012 and have the best technology and selection of properties. Building passive income takes a long time. Always start small and work your way up. Consider creating your own income producing products that require little-to-no startup capital. I never knew that one day, a book about how to negotiate a severance would generate more passive income than the rental income from a $1,200,000 property. There is a reason why we worked so hard on our creativity as kids. Your goal is to build enough passive income so that by the time something inside you vigorously wants a change, you’ll have the financial means to make it happen. All the best on your passive income journey!